As the NFL continues to make rule changes with player safety in mind, the league might consider making yet another type of tackle illegal. As of now, it’s entirely legal for defenders to bring down a ball carrier by grabbing onto their hair. But according to the league’s head of officiating, Al Riveron, the NFL will discuss making such tackles illegal. That doesn’t mean it’ll result in a new rule before next season, but it will at least be a point of discussion. Riveron shared that tidbit during his weekly rules video during which he discusses controversial plays from the past week. 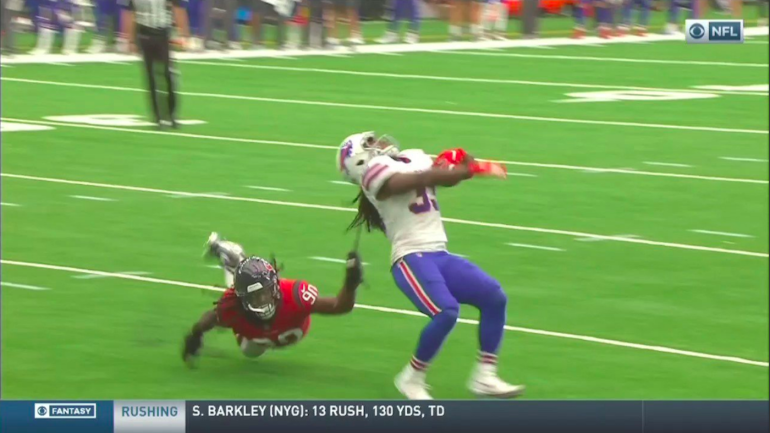 In that video, Riveron noted that the hair tackle by Texans linebacker Jadeveon Clowney on Bills running back Chris Ivory was legal, but a discussion with all relevant parties will be happen after the season. It’s a long video, but it starts with the incident in question. As Pro Football Talk’s Mike Florio noted, if the NFL were to pass a rule that bans hair tackling, they might see some players grow out their hair in an attempt to draw penalties. Florio also wrote that the current CBA “states that players cannot be disciplined in any way based on hair length,” which means the NFL rightfully can’t just ban long hair. The obvious solution is to do nothing. Hits like the one Ivory endured, while painful, aren’t all that common. It’s certainly happened before — here are a couple of those instances — but this is hardly one of the biggest problems facing the NFL right now in regards to player safety. In the meantime, if you’re an offensive player going up against the Texans, might we suggest finding a way to tuck your hair inside your helmet. As if going up against Clowney wasn’t already scary enough.